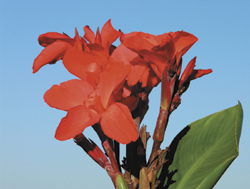 Liberty ® Toy TM Red (ppaf) is the first of a line of ultra-dwarf cannas. It blooms at only 12” tall in early summer and matures to only 24”. Brilliant red blooms contrast the medium-green foliage and continue until frost. This dynamite little beauty gives the bold splash of color characteristic of cannas, but in a “pint-size” plant appropriate for smaller spaces, borders and patio container gardens. Like its taller (3-4’) cousins the Liberty ® dwarf TM Cannas, Liberty ® Toy TM Red is sturdy, increases rapidly, sheds spent blooms quickly and cleanly, and is resistant to heat, rot and leaf rollers.